Originally published under the title "Election Time in Turkey: Tossing the Dice Again." 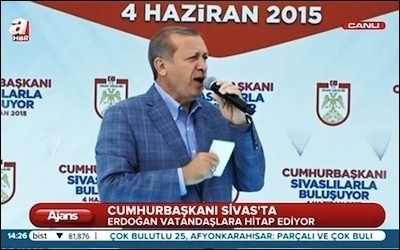 Turkish President Recep Tayyip Erdogan, in violation of the constitution, campaigns for the AKP three days before the June 7 parliamentary elections. By this autumn, the Turks will have gone to the ballot box four times in about a year and a half. Three of the elections had been scheduled in advance: municipal in March 2014, presidential in August 2014, and parliamentary in June 2015. But apparently the Turks will have to elect another parliament a few months after the one they voted for on June 7. Not because there was large-scale vote-rigging in the last election, but rather because President Recep Tayyip Erdogan did not like the election results. After governing Turkey for nearly 12 years as prime minister (head of the executive power), Erdogan last year devised an ambitious plan: He would run for the (largely symbolic) presidency, entrust his Justice and Development Party (AKP) to a reliable prime minister who would win a large enough majority to pass constitutional amendments in the June 7 elections, and amend the constitution to introduce an executive presidential system. This would effectively assign all power to the president, thus paving the way for a modern-day, elected sultanate system. Erdogan has an ambitious plan to effectively assign all power to the presidency. Before June 7, Erdogan -- who as president is supposed to remain non-partisan according to the constitution -- actively campaigned for the AKP, demanding votes enough to earn a comfortable absolute majority of 400 seats in Turkey's 550-member assembly, capable of amending the constitution. Instead, the AKP won merely 258 seats, not even a simple majority sufficient to form a single-party government. Prime Minister Ahmet Davutoglu -- largely known as "Erdogan's Medvedev" -- was faced with the choice of signing a coalition deal with one of his political nemeses in parliament: either the main opposition social democratic Republican People's Party (CHP); the Nationalist Movement Party (MHP); or the pro-Kurdish Peoples' Democratic Party (HDP). For over a month, Davutoglu pretended to be negotiating a German-style "grand coalition" with the CHP, although it was an open secret that he was under pressure from Erdogan (his "Putin") not to sign a deal with any of the rival parties. Instead, Davutoglu had to maneuver for reelection in the autumn. Any coalition government would be the end of Erdogan's dreams for an overriding, sultan-like system. So he wanted to throw the dice again. Formal coalition talks between the AKP and CHP unsurprisingly failed on August 13, with Davutoglu pointing to early polls instead of a much-needed political reconciliation between Turkey's Islamists and secularists. A historic opportunity was missed, according to CHP's leader, Kemal Kilicdaroglu. The AKP has rejected the path of political reconciliation with Turkey's secularists. Erdogan's move has a mathematical justification: He calculates that in new elections, the AKP will come out on top of every rival. With a little effort, the AKP can try to broker an election alliance with two conservative splinter parties whose votes on June 7 totaled a mere 2%. 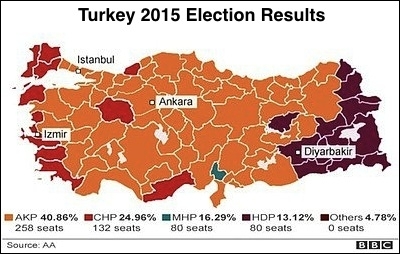 That mere 2%, plus the chances of winning back some constituencies that the AKP lost only marginally to rivals, are not too likely but not altogether impossible scenarios. If the AKP performed worse in a reelection than it did in June, that would not mathematically make a difference: For Erdogan there is no difference between the AKP's present 258 seats or, say, 243 seats in a re-election, as both would mean a coalition government and no constitutional change that he craves. But, he further calculates, if the AKP can win 276 seats and form a government, it may then seek alliances in parliament to amend the constitution in line with the would-be Sultan's wishes. There is a president [himself] with de facto power in the country, not a symbolic one. The president should conduct his duties for the nation directly, but within his authority. Whether one accepts it or not, Turkey's administrative system has changed. Now, what should be done is to update this de facto situation in the legal framework of the constitution. To which a prominent Turkish columnist, Ahmet Hakan, replied that "This is almost a coup d'état." The Turkish president is on a dangerous path. He knows no limits in breaching the constitution -- which it is his duty is to safeguard. He is wrong to claim that "whether one likes it or not, Turkey's administrative system has changed." It has not changed, although he is trying to change it. The constitutional articles regulating his powers are precisely the same as they were for his predecessors. This precisely is the point we should stick to -- "saying" something does not mean it is true. (Although, he is using the same technique as Hitler's propaganda minister, Joseph Goebbels, who said, "repeat a lie often enough, people will believe in it. The real truth is, the man is suffering with advance stages of Paranoïd Schizophrenia- as in 'cut from reality.' The game is over, but he is in denial. This is a nightmare for Turks, a dark page in our history, fast coming to an end. The nation soon will wake up and wonder, as Germans did after 1945, what possessed them to follow that evil lunatic. Still, make no mistake -- like Hitler, he too will fight on until the very last moment. Indeed, when he does go down, he will bring down many with him. We must make sure it is not the whole country.